American Zombie: The Wisner Trust - What's in a name? An extra $163,837. The Wisner Trust - What's in a name? An extra $163,837. After a rather uneventful couple of months on the Wisner Trust battlefront, it seems the "cease fire" is over. Or maybe it's not...first we have to figure out what the CeaseFire program even is and why it's getting the largest block of cash from Wisner next year. The 2014 Wisner Grant proposals have been out for a couple of weeks now and the two largest blocks of cash requested are going out to Mayor Landrieu's CeaseFire program ($348,600) and the Mayoral Fellows Program ($233,837). American Zombie: The Wisner Trust - Are there missing funds from the Ceasefire New Orleans program? In that story I posted a video of a Wisner Trust Advisory Committee Meeting where Wisner heir Michael Peneguy questions Mayoral appointee to the Trust and city attorney Erica Beck about the nature of the entities, NOLA for Life, CeaseFire New Orleans, and the Mayoral Fellows Program. Wisner Advisory Committee Meeting - Nov. 26, 2013 from Jason Berry on Vimeo. The main issue is that the Mayor's Office seemed to be shifting money from one program to another after the money had been allocated. 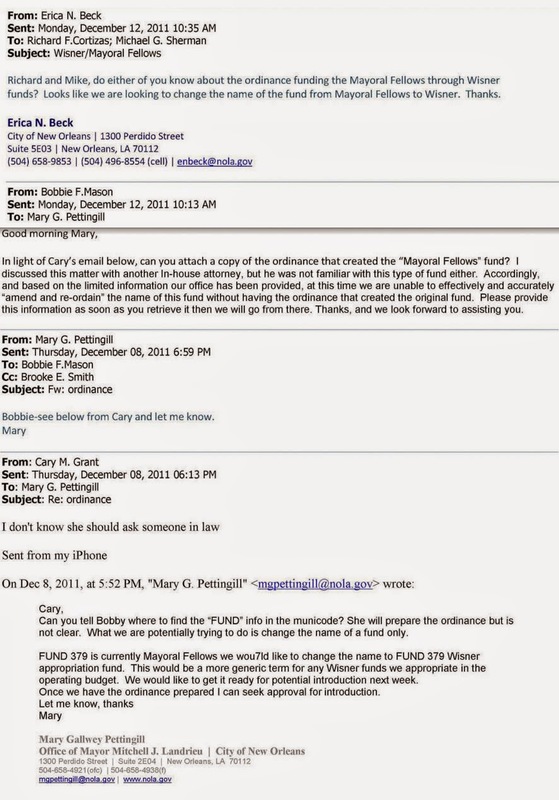 Beck attempted to explain the matter by stating that the Mayoral Fellows Program was simply an "outdated code" that had been changed....I still don't understand what that means or why it was "outdated". A. What will the new name for the program be? Beck: The Mayoral Fellows program is not being renamed. The budgetary fund code, which is named Mayoral Fellows, currently includes allocations for the Mayoral Fellows and Ceasefire. The budget code may be renamed to accurately reflect everything contained therein. B. What is the actual intent of the current grant? Got that? Good because I sure don't from that explanation. But there's a good reason why...she isn't telling us the whole story. So I suppose the question is what is "Fund 379" now named in the municipal code? Are they changing the name of the Mayoral Fellows Fund to "Wisner" in order to funnel money to other programs? In May, the city solicited applications. Early in July, before the participating organizations were announced, The Lens asked Landrieu spokesman Tyler Gamble how the process worked. A review panel made up of “community, educational, and philanthropic institutions,” would recommend applicants to the city, he wrote in an email. “There will not be a formal announcement of the review committee meeting,” Gamble wrote in the July 11 email. After the winners were announced, Gamble said the committee met on July 14 and named the participants. None of the Robert Wood Johnson money is being funneled to the groups, Gamble added. But the call for applications released in June mentions the possibility of “future funding opportunities.” Gamble said that refers to the pilot program. "Future funding opportunities" is interesting fo' true. What else is interesting is the amount o'cash being parked in the Mayoral Fellows program from Wisner in 2014...$233,837. From my understanding of the program, traditionally a single person is awarded the grant to work with the Mayor's Office, essentially as a paid intern, and the amount paid to the fellow in the past has been up to $70,000. Remember former appointee to the Wisner Trust Advisory Committee (predecessor to Erica Beck) Michael Sherman was a former recipient of the Mayoral Fellows grant. Why are they now asking for $233,837 as opposed to the usual 70k? Are they planning on increasing the single grant to that amount? Are they going to name multiple grantees this year? Or....are they planning on shuffling the extra $163,837 out to a different thingie altogether? The other issue I want to point out is that the merits of the CeaseFire program are arguably just as questionable as the Nola for Life program if not more. The New Orleans CeaseFire program was modeled off the one incorporated by the City of Chicago. The Department of Justice audited Chicago's CeaseFire program and found it to be largely ineffective. This report was published in 2009, one year before Mayor Landrieu took office. The program was already being questioned in Chicago when we decided to mimic it here in New Orleans. In fact, the CeaseFire program was later scrapped by Chicago. Curious that the Mayor's administration is questioning the effectiveness of Nola for Life but not CeaseFire. Neither program seems to have any real level of performance evaluation built in to the grant process so there's no way to judge the effectiveness of either one. UPDATE: Maldonado just published this story about the approval of the grants this morning on The Lens. I did not realize Ceasefire was under the Nola for Life "umbrella". Regardless, it adds more credence to my 2nd point about the merits of the program. The article also states that last year the Mayoral Fellows program received the same amount as this year, $233,837 and that a single fellow received a $40,000 grant as opposed to $70,000 I stated had traditionally been paid to the recipient. If correct that further exacerbates the question of where the money in the program is actually going. CORRECTION: The Mayoral Fellows grant amount has traditionally run between about $150,000 to $180,000. Apparently only last year was it lowered to $70,000.